Want a fountain for your landscape or garden but dont want a large pool and stone surround beneath it? Our years of experience designing and installing fountains has allowed us to perfect installing fountains in many different ways. This article will focus on installing a self-contained water fountain with an auto-fill sump reservoir. So just what is a self-contained fountain? A self-contained fountain is designed with a bottom bowl which catches the water that cascades from the upper tiers and recirculates back up the fountain via a water pump placed in the bottom bowl. This eliminates the need for the fountain to sit in a pond or large pool where the water falls into. Here’s an example of an installed self-contained fountain while running. While they are certainly a beneficial design from a space-saving standpoint, they still have some shortcomings. A traditional fountain has a much greater pool of water to draw from then a self-contained fountain. Self-contained fountains may not have a very deep pool of water to draw from, and this is a disadvantage because if the water level drops too low it will put the pump at risk of burning out if begins sucking in air. While a self-contained fountain will lose only a minimal amount of water from spillage by design, it will be at greater risk of water evaporation. This means that you will have to monitor the fountain regularly to make sure that you maintain a suitable water level. So what can you do to avoid this problem? 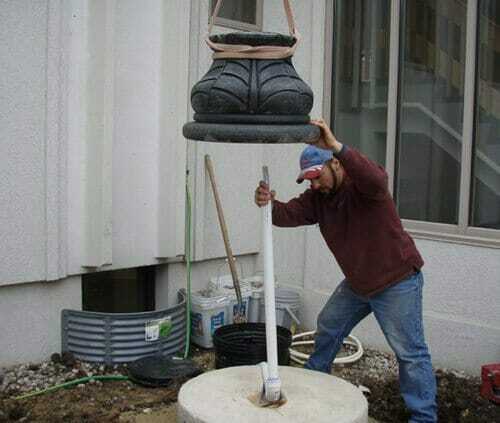 Our years of experience in installing fountains has taught us some useful tricks. Here at Carved Stone Creations, we have come up with a great solution for installing self-contained water fountain. 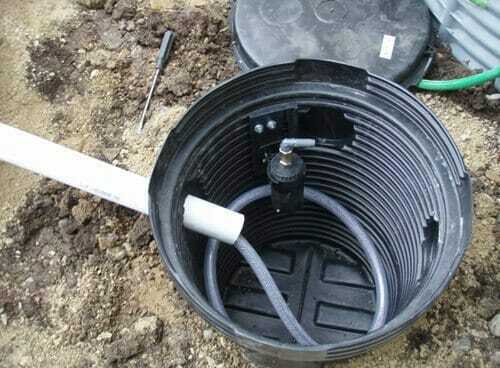 Rather than placing the pump in the bottom bowl of the fountain, we feed the water line from the fountain into a sump reservoir where an auto-fill pump and a separate water line fed from the house or a sprinkler system constantly fill and monitor the water supply for the fountain. This allows your fountain to be nearly maintenance free! No need for checking the water level of the fountain frequently. 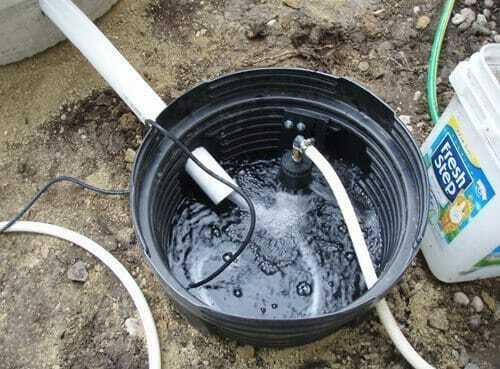 This also reduces the potential for debris like leaves and algae growth from blocking the water pump inlet or being sucked into the pump. You’ll still need to clean your fountain, but you won’t have to worry about water inlet blockages. So how do we set this system up? Let’s take a look at the installation process: First, we take a concrete riser base (which will be covered by landscaping mulch or gravel after installation is complete) and cut a groove in it to run the PVC water line to the fountain. Next we dig a hole for our sump reservoir. The reservoir will remain out of sight in the ground once the installation is finished. Next, we assemble PVC pipe which will act as the return line for the water in the bottom bowl and run the flexible tube through the PVC to feed water to the top of the fountain which will in turn cascade water over the upper tiers. 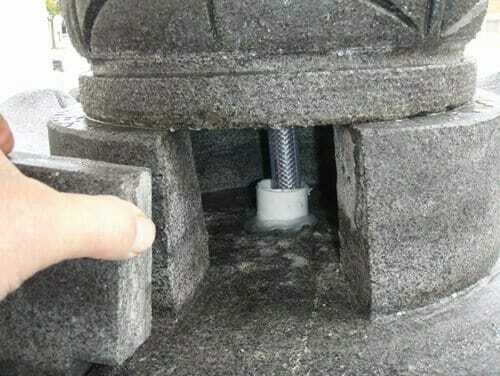 The base of the fountain is carefully lowered over top the riser and the water line is fed through the hole. After this, each part of the fountain is lowered in place and adhered together with high strength epoxy. Here you can see the reservoir is filled. The Auto-Fill regulator will constantly monitor the water level and add water to the sump as needed. Heres the sump with the cover in place. 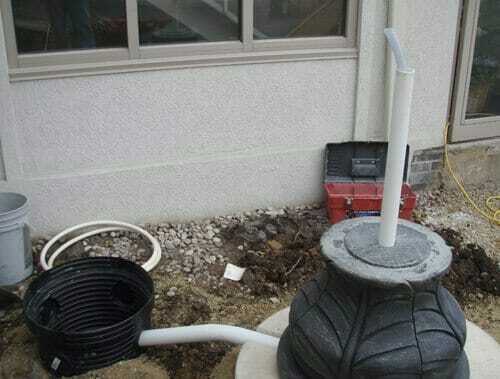 It can be easily accessed and opened to maintain the pump if it is covered with a loose landscaping rock. Here you can see the inside of the cavity in the pedestal above the bottom bowl. 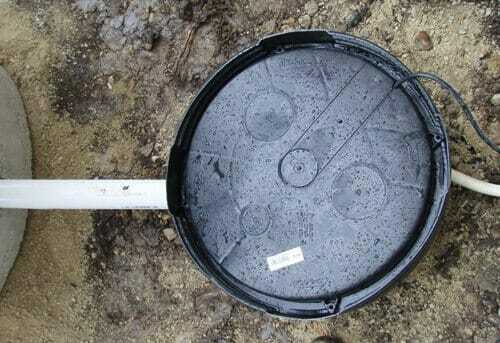 The hole is sealed beneath the PVC pipe and the PVC thus acts as the drainage point for water that will return to the sump and recirculate water throughout the fountain. A simple cover piece wedges in place to conceal the opening. And here is the finished result. A beautiful, low maintenance fountain that won’t take up a lot of space in your landscape and will run efficiently. We can put our expertise to work for you. We can design and install virtually any type of fountain you desire including disappearing fountains and large estate fountains. Inspired to add something similar to your home? Let us be your source for a new fountain in the Midwest. Carved Stone Creations is located in Kaukauna, WI. We are a reasonable drive away from many Midwest metro areas including Milwaukee, Madison, Chicago, Indianapolis, Fort Wayne, Minneapolis, St. Paul, Grand Rapids, Ann Arbor, Traverse City, Davenport, Des Moines, St. Louis, Kansas City, Cincinnati, and Columbus. Visit our showroom to see first hand what we can design for you. Our convenient centralized location also means we can bring all of the tools and heavy equipment we need to tackle any installation job. We understand the effect our harsh Midwest winters can have on exterior stonework and we design and install architectural stonework like fountains, statues, exterior stone veneer, etc with those factors in mind. 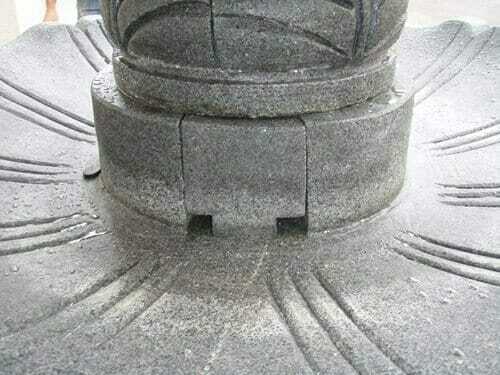 Well, make sure the stonework we install for you stands up to the weather and the test of time! Outside of the Midwest? We can install there too. We have done work from New York to Florida to California as well.